Two words that you hear constantly in education are “standard” and “normal.” If I’m being completely honest I must tell you that these words drive me absolutely crazy. In a world in which innovation, invention, and creation dominate our culture, we continue to focus on standardizing and normalizing our students. Shouldn’t our goal for students in education be everything but standard and normal? Can we actually define standard and normal? Do you know any standard or normal kids? And if being standard and normal is the goal – I must ask how can society improve? Complacency and maintaining the status quo is unproductive. AND, what makes even more sense is that I want every child to be everything but standard and normal. I want students to burst down the idea of being normal. I want students to feel like they can be themselves and that it’s ok to deviate from conformity. I want them to use their gifts to change the world even if those gifts are not reflected on a standardized test. I want my students to live in an unstandard world in which they take their gifts and passion and change the world. Yes, change is a good thing. I want their to be zero pressure when students take the ACT or SAT. I want Colleges, Universities, and employers to measure possible applicants not by a score but rather how one thinks. The standard for entrance should be unstandard individuals. These are the students and individuals that are going to continue to push the status quo. AND in this transitional/transformational world this is exactly what is needed. Every child should come to school each and everyday NOT to conform to a norm but rather create their own norm. 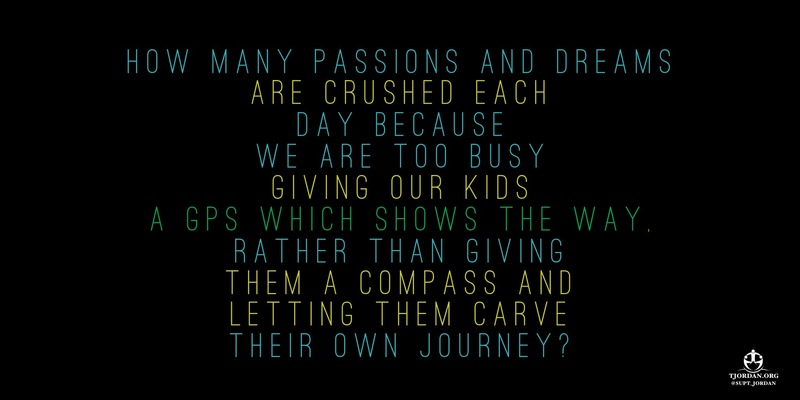 How many passions and dreams are crushed each day because we are too busy giving our kids a GPS which shows the way, rather than giving them a compass and letting them carve their own journey? I understand that this talk is not standard or normal coming from a superintendent but I believe we must do better. We must embrace each child every single day. We must celebrate and build on their talents every chance we get. We must say that abnormal is awesome and they should never substitute their passion for standard or the status quo. Simply put, we need to unstandard and abnormalize education.